Where Did All The Weeds Come From? In China it is the year of the snake, but here in the Midwest most gardeners will agree it seems to be the year of the weed. Weeds are everywhere and are not even slowing down as summer moves along. Master Gardeners have been very busy with clientele bringing anything from a single weed to an entire bushel basket full of weeds pulled from the yard. Weed seeds typically germinate in the spring while there is ample soil moisture and good strong sunlight. This is true for all our weeds, annuals, bi-annuals and perennials alike. What has seemed to happen this year is that our temperatures and soil moisture levels continue to remain right where weed seeds can germinate easily. Anywhere there is a bit of open ground between perennials, shrubs, annuals and our vegetables is enough space for weeds. There is a garden adage that says " One year's seeding, seven years weeding". I share that because in 2012 when it was hot and dry and most gave up on gardening, the weeds we normally would have managed continued to grow, flower and set seed. 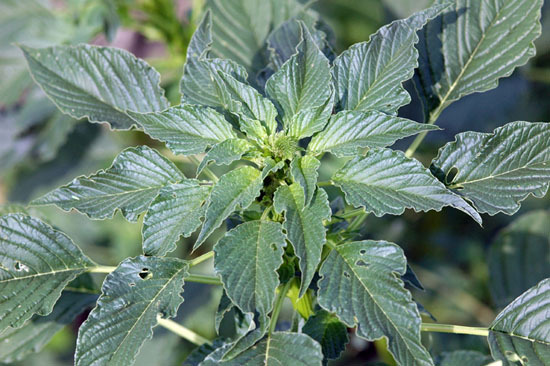 Our common pigweed for example can produce about 200,000 seed per plant and most agree that weeds can produce anywhere from several hundred to several thousand seeds per plant, depending on species. Sure not all seed produced will remain viable, but just a 10th of those 200, 000 pigweed seeds still give us 20,000 that can grow and that may be just one of the weeds you are dealing with! Gardeners have had dandelions coming up in the vegetable garden looking like they have been sown on purpose (they do resemble leaf lettuces while they are young). If you like to cook with purslane, this has been your year. Purslane makes a large round rosette of foliage with a central taproot. Chop it up with your hoe out of frustration and every piece can take root and grow. There has been an abundance of crabgrass not in the lawn where you would expect it, but in the flower and vegetable gardens. Allowed to grow and crabgrass will root along the radiating branches at every node. There is a winter annual called chickweed that was supposed to have died away already and it has not. As it continues to grow it produces very small white flowers along its length. These seeds then fall directly onto the soil below waiting for late summer and early fall to germinate and grow. At least this one will hoe off easily as the root system is not substantial. If there is a bed that has already gotten out of control, perhaps the best management strategy now is to be sure that those weeds are not allowed to set seed if that is your only option for the rest of the summer. Don't let those weeds add to the already abundant seed bank in your beds.